The way Raa-consult1@keemail.me Ransomware works makes it look similar to infections that use the CrySIS Ransomware engine. However, based on what we found out while testing this malware, it appears to be that it could be a slightly different version, created to extort money from users who understand Russian. The malicious program encrypts user’s data and displays a warning that demands to pay a ransom in exchange for decryption tools. Since you are here, you probably realize that paying the ransom may be not the best decision. Users cannot know if the infection’s creators will be willing to send the decryptor after the payment arrives or if they have this tool at all. Thus, our advice to you is to eliminate the threat with the instructions placed at the end of this page. 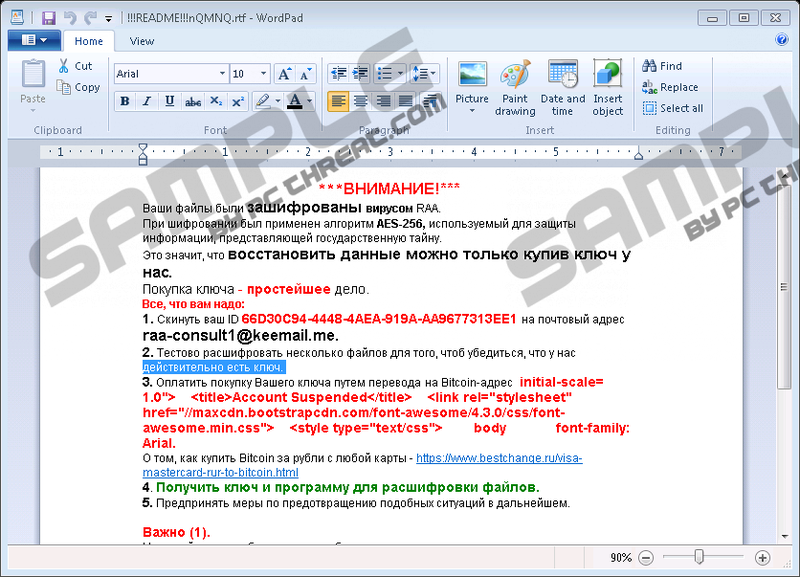 In this text, we will explain to you more about Raa-consult1@keemail.me Ransomware, but first of all, it is important to understand how such infections enter the system. Needless, to say that the threat installs itself without the user’s permission, although he launches the installer. In this case, it could be that the malicious program’s setup file was made to look like a harmless text document, invoice, and so on. Usually, such data is distributed through Spam emails or malicious web pages. The next time you receive attachments with Spam or download something from unreliable sources, we advise you not to open it right way, but check such data with a trustworthy antimalware tool. Raa-consult1@keemail.me Ransomware should settle on the computer by placing randomly titled files in the following locations: %APPDATA%, %ALLUSERSPROFILE%, %USERPROFILE%, %WINDIR%\Syswow64, %WINDIR%\Syswow32. It might also create a couple of randomly titled value names in the Windows Registry. These value names should be in the HKLM\SOFTWARE\Microsoft\Windows\CurrentVersion\Run directory. As a result, the malicious application could be able to automatically launch itself every time the user turns on the computer. Eventually, the malware should begin the encryption process and during it, Raa-consult1@keemail.me Ransomware could lock all photos, videos, documents, and any other personal files. Also, this threat targets third-party software programs downloaded and installed by the user himself. Therefore, after the encryption process is over, you might be able to use just programs created by the Microsoft company. Other applications, such as Google Chrome, Skype, and other, would need to be reinstalled. The personal files cannot be unlocked without specific decryption tools, so the only other way to recover such data is to use copies of it. Perhaps, you uploaded the most precious files on social media or placed their copies on external hard drives, flash drives, and other storages? But before you rush to get such copies, we would advise you to take extra precautions and erase the malware first. After the infection locks your data, it should open a document with a message from Raa-consult1@keemail.me Ransomware’s creators. It says that you have to pay a ransom if you want to get the decryption tools. The price is not mentioned, but there is an email address to reach the malicious program’s developers. Even if the price does not appear to be significantly huge, we would advise against paying it. The malware has already made plenty of damage, and if you pay the ransom, you might lose your money for nothing. If you have no intention of giving your money to Raa-consult1@keemail.me Ransomware’s creators and came there to learn how to delete the infection, there is a removal guide below this text that should help you with this task. Clearly, the instructions are for those users who want to erase it manually. Thus, they show how to locate and get rid of its malicious data. Moreover, the threat can be eliminated with a security tool too. It is a perfect option for those who want not only to clean the system but also secure it. Just keep the antimalware software updated and it should protect the computer from various threats. Also, it can be useful at times when you encounter suspicious data and want to check if it is safe to open. No matter how you choose to remove the malware, you can leave us a comment below if you need more assistance or have some questions about this infection. Access the Explorer by pressing Windows Key+E. Search for executable files that have random titles. Press Win+R, type regedit and click OK to open the Windows Registry. Find value names with random titles, right-click them separately and press Delete. Quick & tested solution for Raa-consult1@keemail.me Ransomware removal.